The third annual Urban Pond Procession (UPP) brought out over 130 Providence-area residents this past Saturday to celebrate the protection of the Pawtuxet watershed and raise awareness about the impact of toxins and storm drain runoff on the health of our urban ponds. Starting at the Mashapaug Pond Boat House behind Ocean State Job Lot on Reservoir Avenue in Providence, participants wearing fish costumes and waving flags weaved through the Reservoir Triangle neighborhood, attracting the attention of children and adults on their porches who were surprised and delighted by the colorful and jubilant crowd parading down their street. "The procession is all about using the arts to celebrate the beauty and history of Providence's ponds", says Holly Ewald, the procession's creator and main organizer. "Most people in Providence have lost their connection to beautiful, natural spaces in the city, and doubt that it's possible to clean up our ponds so we can enjoy them without toxins or bacteria threatening their health. That's why we're bringing our message—that we can restore our ponds—right to the people, where they live, to get them excited about the possibilities of creating safe places to play and enjoy for all our city's residents." The Rhode Island Department of Health warns fishermen not to eat the fish from these waters yet some Rhode Island families rely on fishing to feed their families. This was why, three years ago, Ms. Ewald, an artist, was hired on behalf of the Department of Health to work with the community surrounding Mashapaug Pond to create new warning signs for the pond that were in languages other than just English and clearly communicated the dangers of the pond to residents through compelling images. Ms. Ewald started the Mashapaug Pond Procession as a culminating public event in June 2008 after working with other artists at Alvarez High School and Charles Fortes Elementary School helping young people design the new signs. Eight signs with stunning visuals are now prominently posted around the pond with warnings in English, Spanish, and Cambodian. New Bedford, Mass. – In a season where politicians, leading scientists and average citizens are discussing the impending urgency of our climate crisis, an important conference is bringing together speakers from multiple disciplines to showcase and discuss global and local solutions to inspire change. The Fourth Annual Bioneers by the Bay: Connecting for Change, hosted and produced by the Marion Institute, will be held in historic Downtown New Bedford, MA from October 23-26. The conference uses the ideas of international and national environment and social justice experts to inspire individuals and groups in local communities into action. Featured speakers include Van Jones and Majora Carter of Green For All and many others listed below. Explains Marion Institute Executive Director Desa Van Laarhoven, "A lot of the rhetoric this election season about a planet in peril, not to mention a bleeding economy, can leave people feeling overwhelmed or helpless. Bioneers by the Bay seeks to inspire and remind folks that innovators – or the environmental and social justice super stars, as we like to call them – are developing and implementing real solutions to address climate change." She continues, "The conference also emphasizes the importance of our actions which matter not only individually in practical ways but, collectively, in shaping a powerful and earth saving social movement." Due to the growing demand from an audience attracted to its rich and cutting edge programming, the event has moved from Dartmouth, MA to the Zeiterion Theatre, a larger 1,200 seat venue in New Bedford, MA with various events happening city-wide. Over the course of the three day conference, Bioneers by the Bay expects to have 2,500 people converse and cross pollinate ideas from a broad range of topics to build a healthier world. In addition to keynote speakers, the event will also include workshops, a youth initiative, films, music, exhibits by sustainable businesses and organizations and a farmer's market with local and organic food. The event's appeal and success hinges upon its diversity. Speakers include a cross section of innovators such as environmentalists, scientists, grassroots activists, physicians, scholars, farmers and entrepreneurs tackling eco-topics ranging from green business to food to farming to diversity. Van Jones, Majora Carter and Simran Sethi will present at the FREE open to the public Bioneers by the Bay kick-off event at 7:30pm on Thursday, October 23rd, at New Bedford's Zeiterion Theatre at 684 Purchase Street. They will present their pioneering ideas for green collar job training and our collective imperative for environmental justice, made all the more critical in today's economic climate. Attendees, from individuals to youth groups and other organizations, leave the event empowered to fight for local, city and state commitments to climate change, build carbon-neutral homes, institutionalize composting and food purchasing programs, develop projects to support indigenous populations, secure funding for school gardens or donate time to progressive nonprofits. Although it's cold outside this time of year, the hallways of the General Assembly are just starting to heat up. As you know, we here at Environment Rhode Island are committed to getting results that protect Rhode Island's air, water and open space. As this year's legislative session gets under way, I'm hoping you'll let us know what you think are the most important environmental issues on which we should focus our efforts. A two-day conference to discuss safer pest control strategies in multi-family affordable housing. Register for one or both days of the conference, depending on your interests and your availability. A light breakfast and lunch will be served. We encourage your organization to come in teams, so that you can learn and strategize together. 622 Washington Street, 2nd fl. Toxics Action Center will release Toxics in Rhode Island: A Town-by-Town Profile outlining all toxic sources and sites in Rhode Island. This report provides residents with the first-ever one-stop source of information about toxic hazards in their communities. It also tells government and citizens how they can take action to protect public health. 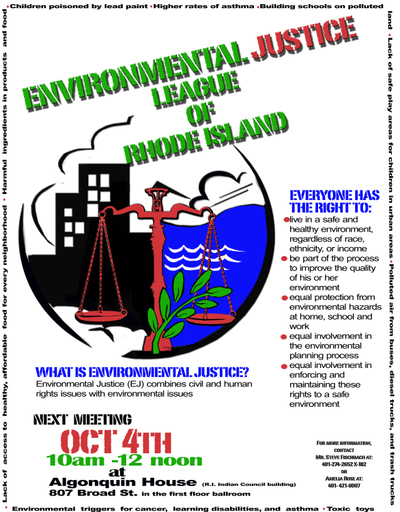 Speakers will be the report author, a public health expert knowledgeable about the impacts these sites have on public health and the environment, a Rhode Island resident directly impacted by the potential siting of a polluting facility near her home in Cranston, and a representative of a statewide advocacy organization. A large map of all toxic sites in Rhode Island. "Celebrating 20 years of cleaning up and preventing pollution."